With TheMaker you can create, edit and preview websites on OS X, Windows and Linux. 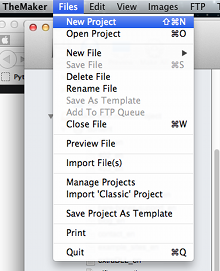 Then publish when ready via FTP. You stay creative, while TheMaker manages your files, media, links and page changes. Reliable, efficient, fast and powerful : TheMaker. The Maker looks beautiful on the Mac with an elegant icon set and close attention to detail makes it a joy to use. The Maker is now available for Windows and includes the new template set, so get a great head start on your next project. The Linux version of The Maker is fully equiped with latest templates and functions. Auto complete on all HTML tags. Keyboard short cuts for frequently used tags. Full HTML CSS vocabulary available at your fingertips. Markdown enabled with support for footnotes and tables. Syntax highlighting of your code for increased readability. 'Dynamic' feature for inserting repeating sections of code. Image handling for convenient syncing and size control. Manage all of your sites files and data with just one application. Full feature industry standard templates to power your project. Built-In Python Interpreter for your custom workflows. Create and save your own Templates. Cross Platform - TheMaker is available for Linux, OS X or Windows. TheMaker was started in 2005 and has always been Free Software in regards to license and price. We have put a lot of work into it and have build a small but faithful community over the years. Ian and Gerald have been guests on Floss Weekly. 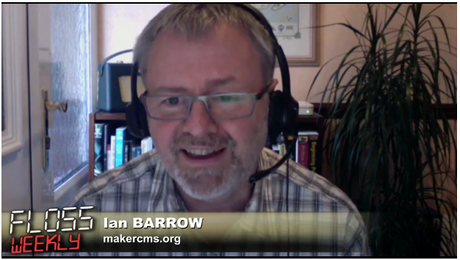 The show that covers Free, Libre and Open Source Software. Thanks to Randal Schwartz and Dan Lynch for having us on their show. It has been a great privilege and a lot of fun. View these example sites to see what is possible. The intuitive user interface is designed to simplify your work so you can stay focused on your creativity. With convenient keyboard short cuts for the most frequent tasks and other elements to further enhance your productivity. Simple to use yet 'feature rich' including Markdown support for easy page writing, take a look at these tutorials for details. As at true content management system, the maker manages and gives you control of all your website data, (style sheets, script files, graphics and any other asset you require) as well as the control of the content on all your web pages. The Maker facilitates importing, manipulation and synchronizing of your graphics files seamlessly and provides a contextual menu in the editor when inserting images into your html code. The Maker provides a logical workflow for website creation and breaks down webpages into their components for easier editing, giving you the facility to edit repeating sections like the header, footer and menus just one time irrespective of the number of pages on your site. Another feature, called maker dynamics, enables you to insert repeating blocks of html with a single line. All pages can be previewed in your browser of choice, enabling you to test your pages across different browsers before committing to the web. The file tree provided in the interface gives you access to all of the files within each site. Files that have been changed are tagged for upload and can be synchronized with your webspace at any time. You can work on your project even without internet access. You can upload your changes at your convenience. The Maker by design creates fully web standard compliant webpages, but plays very nicely with database driven dynamic sites that use Django, Rails, Turbogears etc. Supplied templates and the ability to save your own templates means that you can build elegant multipage sites in a matter of minutes. The built in help system links to 'best in class' internet tutorial and reference data for HTML and CSS, meaning that you are only a 'click' away from that missing piece of knowledge required to finish your page. The Maker is a fanatastically quick and efficient application to create and manage websites, you can have your first multipage site running locally in under five minutes! And if you have your webhost credentials available your pages can be visible on the internet seconds later! Naturally, this site was created using The Maker. Acknowledgments to all those that have enabled TheMaker to come this far.